The Learning Team are getting increasingly excited as they get closer and closer to moving into their brand new Learning Studio. Early Years Coordinator, Lucy Turner, has been out and about exploring and testing new ideas about how this Reggio Emilia inspired space might be used. Reggio Emilia is an approach that underpins Whitworth’s Learning Programme as a whole but is particularly relevant to the Early Years Programme. In Reggio thinking there is a belief that the environment is the third teacher and that it is crucial to provide children with plenty of natural light, access to the outdoors and space for movement to encourage independent play, and curiosity about the world. 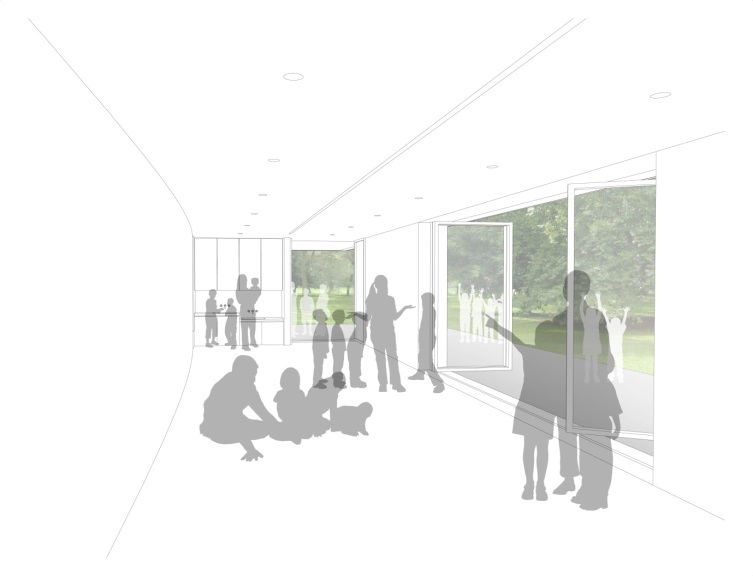 Our new Learning Studio will provide just that; it’s huge bi folding doors will let light flood into the room and will open straight out to the new sensory art garden, extending the room and blurring the boundaries between indoor and outdoor. In our new programmes much more emphasis will be put on outdoor learning, utilising the amazing resource that is Whitworth Park and the art garden. Children will be encouraged to work outside whatever the weather, whether it’s shadow drawing in the sunshine or using the inclement Manchester weather to our advantage to create rain and puddle paintings. With no tables and chairs in the Studio the space will have the feel of an artist’s studio, or Atelier, rather than classroom. This will also allow the space to be much more versatile as each day it is used by a different audience from adults to babies, students to older people. As part of the Early Years programme the space will be regularly transformed into an Atelier which will host Reggio inspired activities encouraging hands on exploration and discovery and for the first time ever we will be able to get as messy as we like!